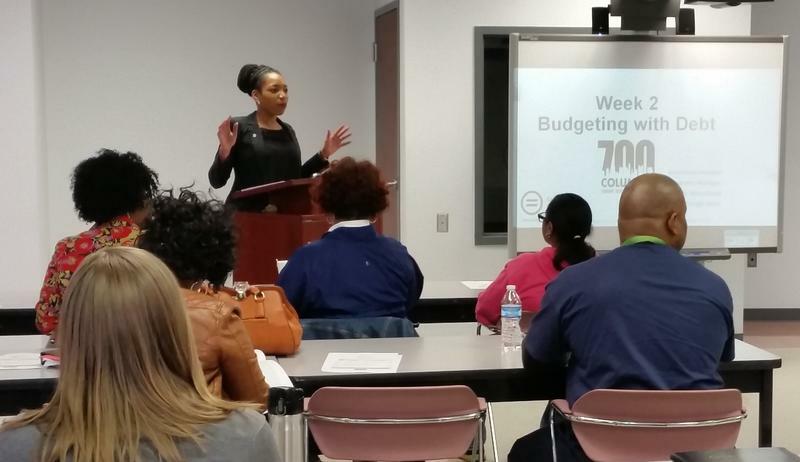 Columbus Urban League's Brandy Moorehead addresses a 700 Credit Score class. Credit scores are all-important. That number determines whether we can buy a car or house, and what we'll pay in interest. For low income people, raising a credit score can be a challenge. A new program aims to help people raise their scores and then keep them high. "What you learn in this class, you apply it and then you'll start to see results." Call it a boot camp on managing your money. 700 Credit Score is the name of the workshops, held during a four week period. Through the course, students learn how to build wealth, make a budget, lower their debt and raise their credit score to a respectable 700. 39-year-old Jehan Daugherty is a single mother of a college student. Five years ago, she lost her job and decided to start a business. It wasn't easy, and she struggled financially. Her savings dwindled and she worried about how to pay bills. "Is there an easier way, is there a better way, am I doing this correctly? Do I really owe these things they're saying that I owe? So that's why I wanted to come to the class and get educated," said Daugherty. Daugherty has taken a full time job to supplement her business income. She hopes an improved credit score will help her to get a lower interest rate when she decides to replace her 12-year-old car. The Columbus Urban League sponsors the classes. Its president Stephanie Hightower says clients learn the basics about paying bills on time. "Think about slow pays. I'll pay a little bit here, I'll pay a little bit there. After a while, that builds up a negative on your current score. Also, to get a bank account, how not to overdraw, how to really manage you know your banking," said Hightower. "So now that you're in a planning mode, you'll be able to see what those numbers are and how they may fluctuate and then you'll be able to forecast, that's the whole purpose of this, forecasting." Jenefeness Houston who leads the workshop, understands that many here may not have known much about managing finances before they signed up for the class. "We had a lady that made a comment, she said in my 45 years on earth I haven't learned as much as I've learned in 45 minutes by sitting in on a class," said Houston. Houston admits she's experienced her own financial problems before. Now she helps others avoid mistakes. "I don't care what socio-economic status, I don't care what race you are, I don't care what gender you are, and I don't care what class you're in, you're going to have a problem eventually. But, if you learn this knowledge now you can prevent it from being so severe," said Houston. Program Manager, Brandy Moorehead stresses it's up to the students to absorb financial lessons from the boot camp workbook. Moorehead says first admit there's a problem. "And a lot of times when you're dealing with creditors and you're in debt, avoidance is typically where our clients choose to kind of handle the problem, but deeper hole that you have to dig yourself out of," said Moorehead. Then they must apply what they've learned. "It's not going to be a magic button that you push at the end of this class and nothing is going to change if you don't apply it," Moorehead told the class. Clients can also talk with financial coaches about what went wrong with their credit score and the steps to improve it. 49-year-old Crawford Wall plans to improve his financial status as he starts a new life with his fiancée. Wall says after going through a divorce, financial security is his goal. "It's more of a cushion, you know having that nest to fall back again, if something happens. So, you know I've been through that so I didn't want to go through it again," said Wall. Columbus Urban League officials say many financial issues erupt when student loans or medical bills are due. Knowing how to maneuver through bureaucratic tangles can ease the budget strain, so people don't get stuck in a financial pinch.